The easy to use, strong ramp is designed to ensure easy access for wheelchair passengers. Entry is further aided by the shallow ramp angle of just 11 degrees (to a typical kerb). Prominent lips to each edge help to ensure the wheelchair’s trajectory and prevent the wheels from leaving the ramp. Wheelchair users may remain in their wheelchair when travelling in a taxi thanks to our comprehensive restraint system in-line with the ISO 10542 standard. 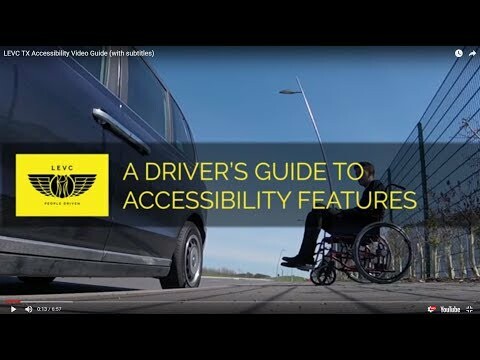 Sometimes restricted mobility impacts the ability to twist so to provide easier entry and exit, the TX features an easily accessible swivel seat which pivots outside of the taxi for better access. Bright, non-slip handles to aid the entry and exit of all passengers, especially those with limited vision, while colourful seat edges help ensure passengers safely find their seat upon entry. On entering the taxi hearing impaired passengers are able to communicate visually with drivers thanks to the clear partition. Once inside, the digital intercom features an induction loop, allowing hearing aid wearers to listen to the driver clearly, the channel is also marked on both sides of the taxi with visible labelling. The interior floor is completely flat, without intrusion, and covered in a slip-resistant material. Thanks to generous internal dimensions there is sufficient room to easily rotate the wheelchair user into a comfortable forward-facing position. The safety features of the iconic London taxi have been protecting drivers and passengers for decades​ & the new TX is no exception - in fact it's our safest taxi ever. The new electric Taxi boasts a range of features that make the passenger experience one of the safest, most user friendly, enjoyable, and accessible in the world.